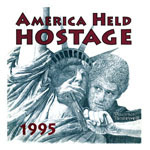 The America Held Hostage calendars demonstrated the frustration-driven creativity of Roman Bodewell—the Norman Rockwell of political incorrectness. Roman Bodewell recognized the source of his vision when he wrote in his 1994 calendar something to the effect of, If you can't have your way, you have to have fun. In fact, Bodewell's inside cover essays "Better than a Riot" and "The Clinton Cartel," are worth whatever you might pay for either calendar. And what representative collector's items these are for opposition to the politics of the pre-Lewinsky, presi-dential first term of William Jefferson Clinton. 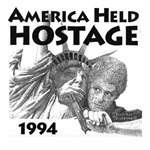 With their generic title stimu-lated by Rush Limbaugh's signature phrase and his counting down of the "days of the raw deal," these Rockwell-like drawings captured the Clinton character to a fare-thee-well. The one satisfaction the calendars now represent, Bodewell says, is the I-told-you-so evidence that Obama-supporting Democrat activists have now recognized (in fact used) all the weaknesses of the Clintons that the calendar artist and others could see in the ignominious pair, even in 1993, as they were moving into theWhitehouse: venal, grasping, mean and thoroughly narcissistic. The calendars also represent for the artist an education in the potential difficulties of mixing entrepreneurship with politics. That is a story for the curious to read by clicking on the word "entrepreneurship. Click on the cover to view the art that makes this calendar such a classic. Click on the cover to view images that make this calendar such a collector's item. Hard-core conservative fun . . . . It'll rub your nerve's wrong if you're a lefty. ©Perspective Publications, All Rights Reserved.